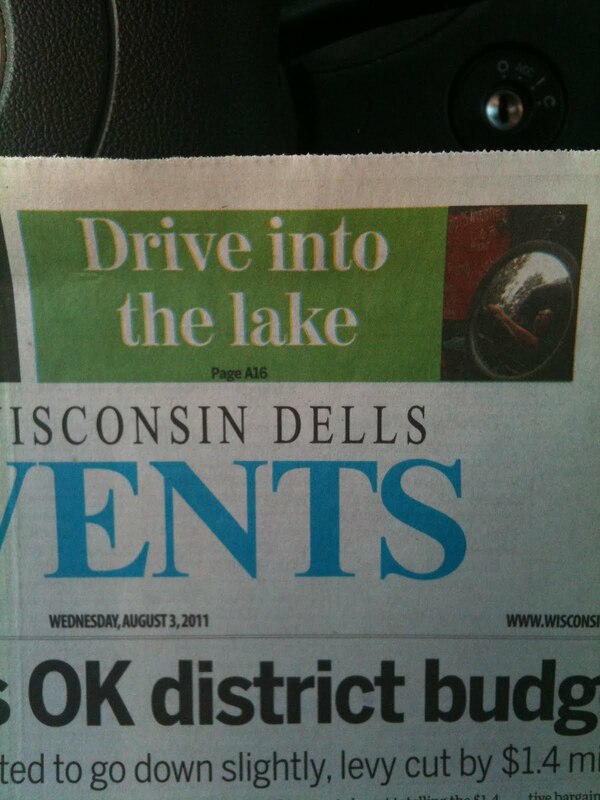 “Just drive into the lake.” - It’s not every day you hear these words while operating a moving vehicle, but that’s exactly what I was told during my latest Dells Bucket List adventure, when given the opportunity to fulfill a childhood dream of getting behind-the-wheel of one of the Original Wisconsin Dells Ducks. 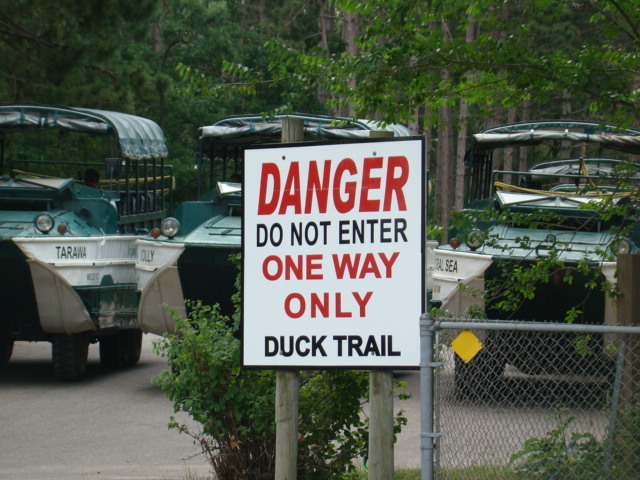 The Ducks have been navigating land and water in the Dells for more than 65 years, and are one of the Midwest’s most-loved attractions. The 8½-mile, one-hour excursions have entertained millions of visitors with tours that wind through some of the most beautiful landscape Wisconsin has to offer. 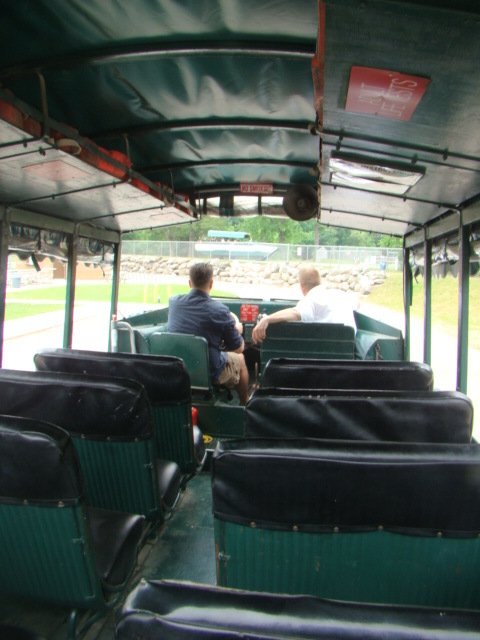 With shady ravines and thick wooded trails on land, to scenic water cruises on Lake Delton and through sandstone rock formations along the Wisconsin River, the Ducks offer a visually stunning expedition that the entire family can enjoy. My Duck experience began with interviewing assistant manager Matt Oeftger, who has worked for the ducks for over 17 years. 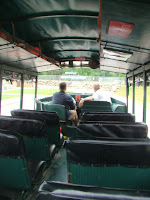 Matt eagerly filled me in on the history of the Ducks and what brought them to the Dells. He mentioned that he was a big World War II buff, and told me how the Ducks were used during D-Day, where more than 2000 were deployed to transport troops and supplies onto the beaches of Normandy. While Matt was telling these fascinating facts about the Duck’s past, I have to be honest; my mind was wandering a bit, wondering if he was actually going to let me drive one of them. I had read that all operators were required to have a Commercial Driver's License, as well as go through six weeks of intense training before they can guide tours. Being I had neither of these prerequisites, I figured that I would only be allowed in the driver’s seat while parked, or turn the wheel while someone else drove. Bracing myself for letdown, I finally got the courage to ask if he was going to let me get behind the wheel. To my surprise, he actually said yes. 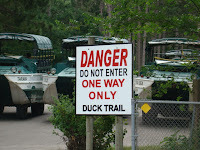 Obviously not going to let me anywhere near a place where I could cause any damage, we got into a Duck, and Matt drove us to the remote parking lot where I would get my crash-course in Duck driving. 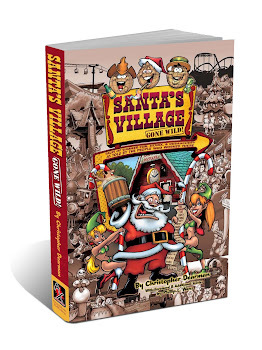 Weighing over seven tons, the only thing I’d driven that could rival the massive size of a Duck would be the old Fire Truck ride with no brakes that I drove at Santa’s Village amusement park as a teenager. 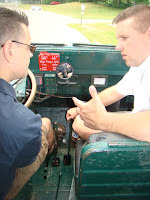 While comparable in size, there was still considerable trepidation when I was told to get in the driver’s seat. Once behind the wheel Matt asked if I’d ever driven stick-shift before. I replied in the affirmative, but having learned to drive it in only a tiny Volkswagen Beetle, I wasn’t too confident that the experiences would be that similar. Adding to my anxiety, Matt said that the Ducks were double-clutch transmission, meaning there would be twice as many steps to remember when switching gears. Hearing this, I just knew that I would end up stalling the engine at some point - which is exactly what happened on my first attempt! 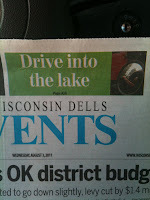 Arriving at the top of a hill, I looked out at the path ahead of me to see that it went directly into Lake Delton. I was moments away from making a childhood dream come true. 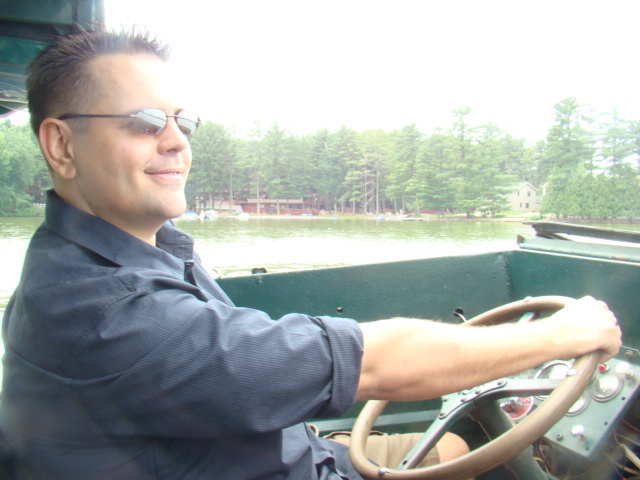 Getting to plunge into the water while driving an Original Wisconsin Dells Duck. Matt started explaining the process of what was about to happen, but it was going in one ear and out the other. I was starting to have second thoughts, but I had come too far to turn back. 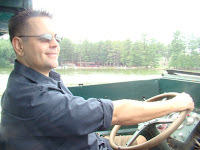 After saying a quick prayer, I gunned the gas to build up speed, and steered the huge beast of a vehicle directly into the lake for a glorious splashdown! The feeling of being on dry land one moment, and splashing into the water the next brought a burst of exhilaration. Once I got my bearings, I gently cruised around the lake with a huge smile on my face, and a sense of accomplishment that stayed with me for the rest of the day. *** I'd like to say thank you to Matt Oeftger for giving me the opportunity to have the behind-the-scenes access, and for risking his life while I was behind the wheel. Also, thanks again for Danielle Rodwell for helping me take a bunch of pictures (which can see more here).